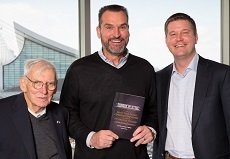 Forged in Steel's authors extend their deep appreciation and thanks to the Pittsburgh Steelers' late Chairman Daniel M. Rooney (left), former U.S. Ambassador to Ireland, for his and his family's gracious support of the book project, as well as the team's. TUNCH ILKIN – the popular two-time Pittsburgh Steelers Pro Bowl tackle who today is a Steelers television and radio analyst and executive partner of Leadership League. His insights into the Steelers way of organizational leadership, motivation and success make him a highly sought speaker for events such as Forged in Steel, the annual conference held at Steelers facilities. He played offensive tackle for the Steelers for 13 years, from 1980 to 1992, and reflecting his abilities as a leader, served as vice-president of the NFL Players Association from 1989 to 1994. In 1998, he joined the Steelers broadcasting team of Myron Cope and Bill Hillgrove, and after Cope's retirement, took on the color-commentary duties. A convert from Islam to Christianity, he is the Director of Men's Ministries for South Hills Bible Chapel. MARK A. MINER – a pioneering public relations and marketing advisor, he has helped craft the image of professional service firms as they became key decision-makers at the table of business and civic leadership. In 2005, he was inducted into the prestigious "Renaissance Hall of Fame" of the Public Relations Society of America, the world's largest organization for PR professionals, for his trail blazing work in the fields of law, engineering and accounting. For more than a decade, he was head of media and public relations for the law firm of Buchanan Ingersoll. Today he is CEO of Mark Miner Communications, LLC (www.markminer.com) and Minerd.com Publishing, LLC (www.minerdpublishing.com), publisher of Forged in Steel and Well At This Time. He co-authored the award-winning Beaver Town of the Beaver Area Heritage Foundation.